Janice joined Richard Burck Associates in December 2017. Through her work at RBA and previous firms in both Seattle and Boston, Janice has extensive project experience ranging from public open spaces, campus planning, to high-profile commercial mixed use projects. Currently, Janice is working on a waterfront fountain plaza at Fan Pier and courtyard design and Boston University. Janice received her Bachelor of Landscape Architecture degree from University of Washington in 2014. The capstone project she worked on with her graduating classmates, “Kintsugi Garden – A Meaning of Mending,” was recognized with the 2015 ASLA Student Honor Award in Community Service. 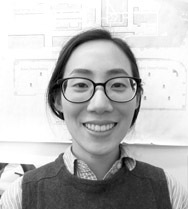 Janice was also on a winning team in the 2013 Seoul International Urban Design Ideas Competition. Janice enjoys working with children and creating playful and meaningful spaces, and she is a Certified Playground Safety Inspector (CPSI). In her spare time, Janice grows vegetables at Fenway Victory Gardens.